Marketing The "New" New Mass! When I heard the report at the end of last week that Pope Benedict has asked the Congregation for Divine Worship to study some potential changes to the liturgy, I got very excited. Think about all the possibilities! Think about what the Mass could be, rather than what it often is. The abuses and experiments, gone! The tawdry celebration of self, gone! Latin back in its proper place! Gregorian Chant! The priest's magnificent back on glorious display! 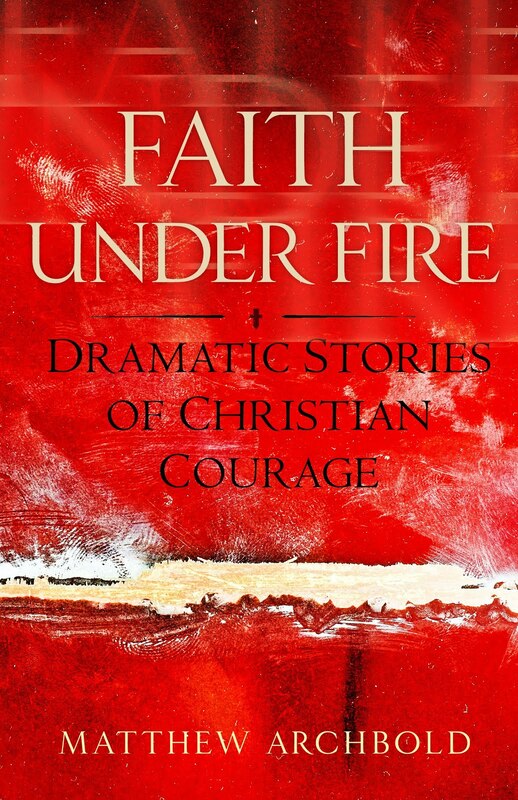 The more I thought about it the more excited I became and the more I started wondering how would such a change be successfully introduced to the faithful? How could we not only have the faithful accept the changes to the mass, but actually desire them? To want them, need them, can't live without them?!? Then like a light bulb, I realized there is no need to re-invent the light bulb. We should use some tried and true methods that have proved their effectiveness over generations. We should use some ol' fashioned marketing techniques to sell the new New Mass to the masses! Now I know what you are thinking. "Patrick, we have no idea what the new New Mass of the masses will look like or even if there will be a new New Mass." I say, don't bother me with such minutiae. We need to build anticipation, we need to build hype, we need to build overwhelming demand! Therefore, let's move full steam ahead with some advance marketing! First, we need a good product name. Fortunately, I took care of that for them the other day when I dubbed the new New Mass, Novus Ordo 2.0. I know, I know. Stroke of genius that. But now we need a marketing campaign sell the Novus Ordo 2.0. As you know, any good marketing plan starts with good packaging. So I decided that I should to help ante-deluvian dolts in the Vatican marketing department out. Therefore I have issued, motu proprio, the first great marketing campaign of the "Reform of the Reform" era. 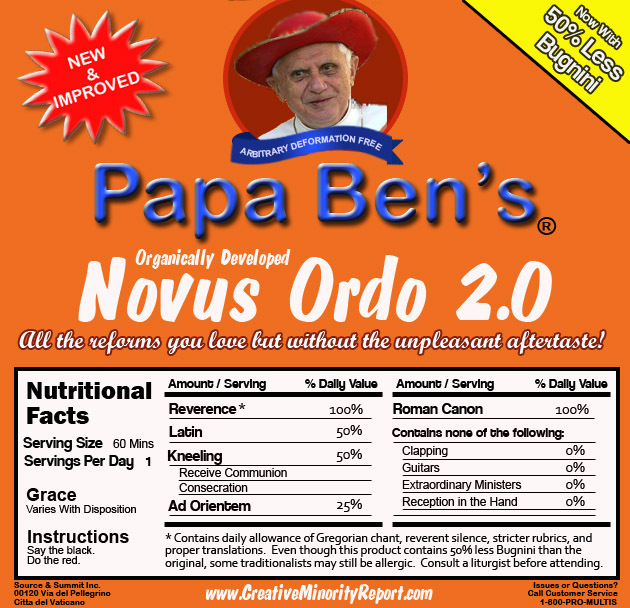 I give you Papa Ben's Novus Ordo 2.0! This idea is a surefire winner, don't you think? Well, I have to go now, the Pope should be calling any minute. If you had a donation button, I would have made an offering. By the way, that beer offer just got upgraded to an18 year-old bottle of scotch. You are one funny dude - dude! You absolutely MUST edit it and find a way to stick in the late night infomercial guy Billy Mays. I'd like to order a full case for my pastor today. Awesome! And besides it contains no nuts! Brilliant! Just brilliant. I don't know how you guys come up with this stuff. 50 percent less Bugnini! Funny. But, is it eco-friendly? Any carbon credits to speak of, and do they count toward a temporal remission of emissions? Bravo!! You continue to outdo yourself. You forgot "full of awesome," which is what this whole post is. What are you crazy? Never even make eye contact with a liturgist! They can steal your soul! Can we send a case of the stuff over to the editors of America Magazine? "Say the black. Do the red." Does anyone under 60 know what that means? Probably. Fr. Z has brought the phrase to the forefront, and it's not uncommon to hear it among theology students/liturgy buffs/seminarians. q) Do you know the difference between a liturgist and a terrorist? a) You can negotiate with a terrorist. Though I'd much rather have some of the original flavour - you know, before Bugnini & Company changed the recipe. Greetings from the other end of the Catholic spectrum. I disagree with much of what's on your blog, but man I've got to say that Papa Ben graphic is genius. Good job. Oh, and someone mentioned "Say the black, Do the Red". I think pretty much, the ONLY ones who care to remember that are under 60. The older folks actually lived through the extreme form of that mentality. Don't get me wrong. I've actually used that line on a priest who started making up his own opening prayers for mass, which reflected his mood of the moment. Intolerable! 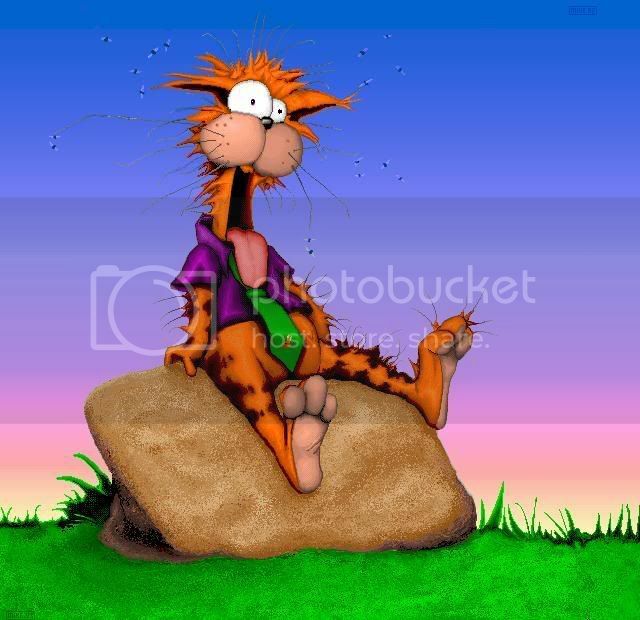 But, I think that many are using the adage, not to prevent crazy innovations but to stop presiders from using the flexibility and common sense that the Church actually calls for from it's presbyters. "Try our Anglican and Eastern flavors too!" Print it and send it to Card. Castrillón by DHL. I's advertising it permanently in my blog. haha. . .
Can you do another for "Papa Ben's Converted Rites" ... for the new Anglicans whom might soon swim the Tiber? "Can you do another for "Papa Ben's Converted Rites" ... for the new Anglicans whom might soon swim the Tiber?" Very nice post (and very nice blog, as well)! I'd like to publish your 'advertisement' of 'Novus Ordo 2.0' in my blog (http://economiadaalma.blogspot.com/, link to your post, and explain to the less informed Portuguese readers the small jokes (like who is Bugnini) behind the conception of your ad. Thank you in advance, and congratulations for the good work. Too funny. I've posted it on me 'umble little blog. Hey, I heard the USCCB rejected the Lukewarm translation of your packaging from the original Commonsense dialect. Comments? On a serious note, how did you do the Nutrition Facts Box? What font is that? Would you please post a link to a high-res version for printing larger sizes? Please, please, please. Oh, did I say "please"? The California Department of Inclusion has banned its importation into California. We need a smuggling network set up post haste! Brilliant, flipping brilliant. I love it! Please send to the Vatican. I LOVE IT! Is it also exported to the Philippines? It has lots of work to do here. My husband printed this up and taped it to my sea salt canister. "pass the salt please dear. ." TOO FUNNY!! Thank you! I know I'm late posting a comment, but I just wanted to say that this was brilliant! Wonderful! I have to disagree with Friar Rick. I grew up with "say the black, do the red" and I have to say I really miss those days. I want to be looking at the back of the priest (hearing the Gregorian Chants, the incense, the bells, the Latin). I want the statuary back in the churches (down with these modernistic churches, that don't even remotely look Catholic! ), the Tabernacle not being located off somewhere where it shouldn't be, no "extraordinary ministers, especially women", and the list can go on and on. This is really great... I appreciate the "say the black, do the red" and I'm only 29. My wife and I are young, what I guess is now being called "Orthodox Catholics"... But one discussion we've had is about girls. I personally have never been shocked to see girls serving at the alter, and in many cases I've seen girls serving with greater dignity and respect than their boy counterparts. But I guess sloughing alter boys is another discussion... Is there a way to have girls be a part of a traditional Mass, in a traditional way? Great picture gave me a few good laughs!